Features a wide variety of space related exhibits including an interactive space shuttle simulator, a Moon rock brought back on Apollo 17 by New Mexico Astronaut Harrison Schmitt, and special tributes to Dr. John Paul Stapp and Dr. Robert Goddard. Commemorates the achievements of men and women who have furthered humanity's exploration of space. Displays larger exhibits, such as the Apollo program's little Joe II rocket and the rocket sled that "Fastest Man Alive" Stapp rode to 632 mph. Commemorates aeromedical and space related tests which were crucial in developing components for NASA's Project Mercury orbital flights and the Project Apollo moon landings. The only such theater in southern New Mexico. A tribute to the Apollo 1 and Space Shuttle Challenger & Columbia astronauts. 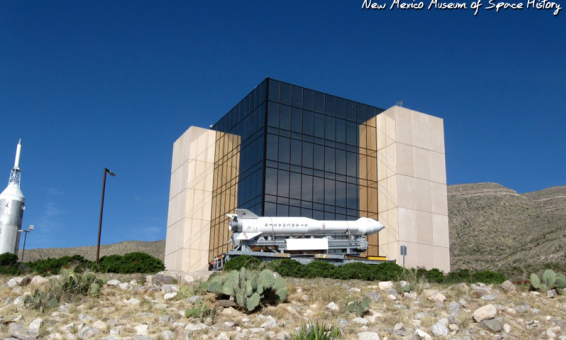 Home to the Museum's new archives and library Researchers and students will find an academic-based collection of New Mexico space history, Holloman Air Force Base and White Sands Missile Range information and photos, as well as NASA publications, photos, and collections. The facility where Museum employees and volunteers conserve and restore the many large artifacts exhibited at the Museum.